Getting married in 2019? Unique Wedding Concepts team of experts presents you the biggest trends for this wedding season! Bridal fashion alert ladies: Polka dot wedding dresses is a must! Playful patterns and romantic spirit will be most brides’ choice! Asymmetrical wedding gowns is perfect for the unconventional brides, while crop tops for those who fancy a two-piece wedding dress! We will also witness groomswear pairing different fabrics and patterns together! Grooms are about to leave traditional tuxedos behind and experiment with mix-and-match looks! When it comes to food, couples will be looking for artistic edible displays. Combine grazing tables with interactive food stations that your guests will absolutely love! Tea bars, guacamole bars and popcorn bars will replace traditional wedding buffets. As for the wedding decoration, velvet linens and pampas grass will rule 2019 weddings! Brides to be will go for structural floral installations and signs that will be even more personalized and funny. Copper has already become our favorite metallic accent that matches perfectly with centerpieces of plants in ceramic or wooden boxes. Your guests will be so thrilled to be a part of your wedding day, getting custom favors! Some couples have gone green and will be giving away packages of seeds! Still, edible wedding favors, like customized olive oil bottles or special spice blends, will be another huge trend, especially for a destination wedding in Greece. Most couples’ unique wedding concept will be “less polished”, but more personalized and natural. Strict color schemes are not popular anymore, so try to incorporate a range of complementary shades in your wedding! Minimalist yet bold elements will highlight quality, not quantity! Wedding on the way? Get excited and worry no more! Choose Greece as your wedding destination and our event designers will plan every single detail of your special day! Need more wedding inspiration? 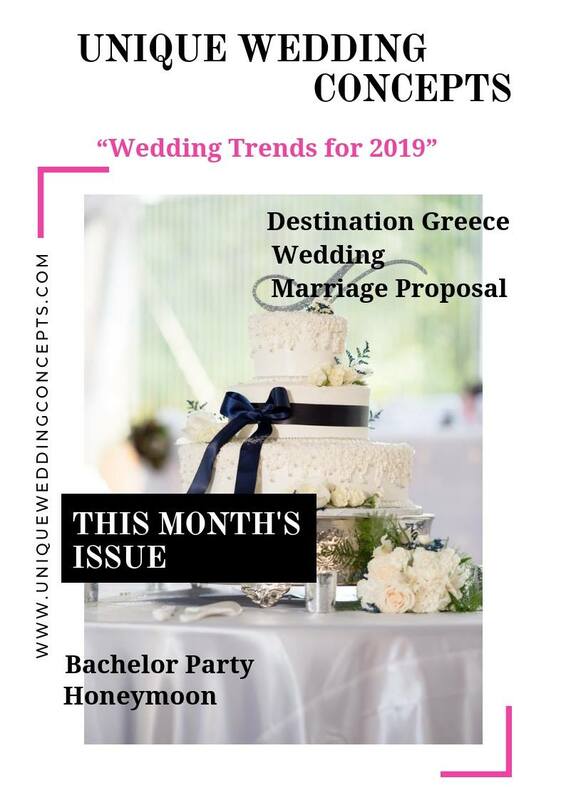 Contact us at info@uniqueweddingconcepts.com !